adjust any character to the height you really want. 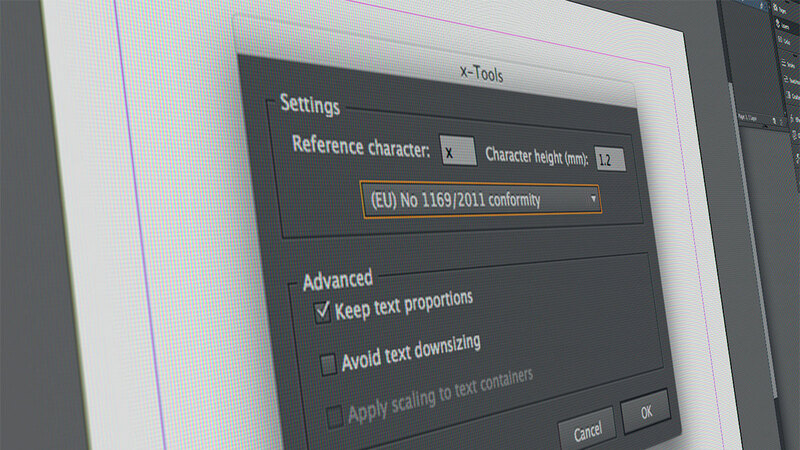 x-Tools is a neat extension for Adobe InDesign to adjust characters to a specific height. The calculation is very precise and it doesn't rely on font metrics. It also has some nice features to process existing artworks. Create, adjust or verify. Precisely and with ease. Developed for the food packaging industry. At the end of 2014 any goods sold to the European market have to meet the (EU) 1169/2011 regulation. An essential part of this regulation is a new definition for the font size which is used for the nutrition declaration and the list of ingredients. In short, the x-height of the font used for this declaration has to be equal to or greater than 1,2 mm. Unfortunately there is no way to set the explicit height of a character by using the basic features of Adobe InDesign. Migrate any existing artwork with ease. The advanced features of x-Tools allow you to transform and migrate any existing artwork. Select a single text frame, a group of objects or even complex tables. Everything will be scaled to the size you specify. It also keeps the ratio if you want it to. Advanced techniques for quick migrations. x-Tools contains multiple options to migrate or adjust an existing artwork. You can choose to keep the ratio of the text, even with mixed font faces. x-Tools will detect the font with the smallest height of the defined character automatically. This saves you a lot of time while updating your artworks to meet the new standards. x-Tools can be installed and used on any computer running Adobe InDesign CS5, CS5.5, CS6 or the latest CC 2018. Add additional seat-licences to any existing licence on demand. This is a great option especially for larger companies. Download the installer to get a fully functional demo of x-Tools. You can use it the whole day, up to 3 times. Get a licence key for x-Tools. Multi-user packs for 5, 10 or even 25 workstations are available.